Lithium SuperPack batteries – an all in one solution .These new Lithium-Ion, LiFePO4 chemistry batteries are often an ideal replacement for many 12V and 24V marine, automotive, caravan, motorhome, work vans and similar battery applications. It might even be for an overland motorcycle if using the smallest 20Ah version; to recharge a camera, phone or laptop for instance. Other examples – take a typical small boat or van which may have a 110Ah to 220Ah lead-acid leisure battery for light continuous loads such as lighting, laptops, phones, instruments, powering a diesel heater, a fridge etc. And for shorter term loads maybe add a small inverter to charge power tools, run a small microwave or travel kettle for example. Using one SuperPack battery it matches well with the Phoenix Inverter VE.Direct 250VA – 1200VA range. Maybe you’ll add in around 100 to 200Wp of solar panels too using a small MPPT. Regardless of the use, whichever SuperPack you choose it’ll be lighter than lead, can be smaller if you wish or give you more Wh in the same space – plus give you around 5 times the cycle life. 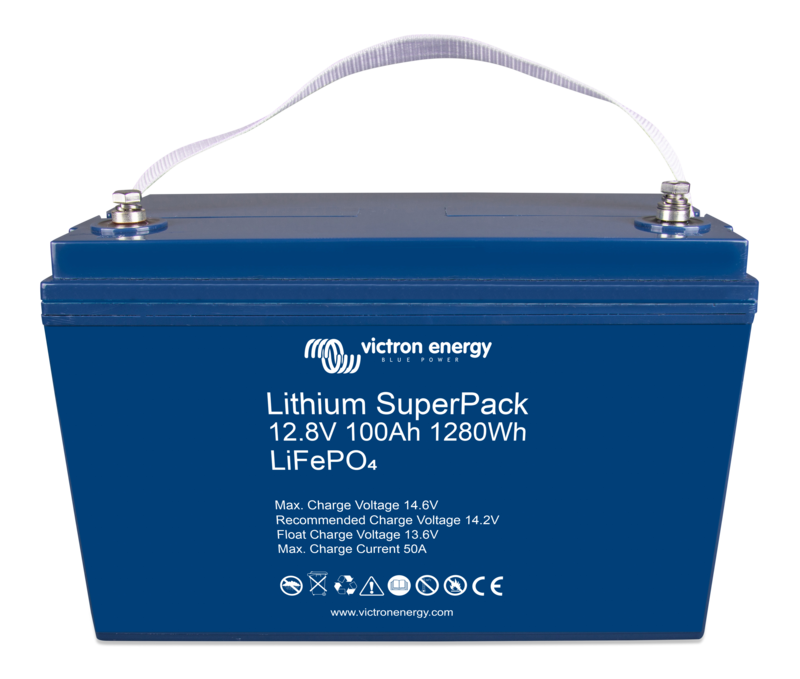 The main difference to Victron’s other lithium (often more kWh) offerings are the SuperPacks keep everything in one package, by having an integrated BMS and safety switch built-in. No additional components are needed as the internal switch will disconnect the battery in case of over discharge, over charge or high temperature. Simple, compact and safe. If you are considering a new battery don’t immediately discount Lithium as being too costly. Whilst it is true that the capital cost of Li-ion is greater than that of quality AGM or Gel batteries – it is also true that the cost of ownership can be less than lead acid types. Much depends on your application, but rest assured – life with Li-ion is far less hassle than lead. Over the last 8 years on my sailing yacht I’ve run AGM lead leisure batteries and Lithium-Ion propulsion batteries. Initially it was AGM for propulsion before discovering the effectiveness of Lithium. That journey taught me a lot about loads, capacity, cost and battery life – it’s one of the reasons why I think we’ve reached a tipping point and why these new SuperPack batteries may just be the ticket for your next project or battery replacement. If in the first instance you are unfamiliar with AGM vs Lithium, then here’s a blog that explains that. When to use a SuperPack? Every battery size and type has it’s own particular use. For instance you may use the Lithium battery 12,8V & 25,6V Smart and the Lithium battery 24V (LiFePO4 & NMC chemistries) ranges (all of which have an external BMS) in quite different applications to the new SuperPack range. So, where to use the SuperPacks? When it comes to replacing lead acid type batteries such as AGM and Gel in many applications, the SuperPack range can be considered the next generation after lead – making it far easier to replace lead with lithium. The only caveats being replacement is down to certain parameters being met, namely – Capacity (Ah), Voltages (12.8V & 25.6V), Discharge and Charge currents (C rates). Do in that case be sure that your chosen replacement fits your criteria by checking the datasheet and be aware the SuperPacks can be connected in parallel, but not in series. Hence in that case you would consider the other Victron lithium products named above. These SuperPacks will give you 2,500 cycles to 80% depth of discharge at 25°C, much more than lead. Let’s compare the 60Ah Li-ion to say a typical 90Ah AGM battery discharged to the commonly accepted economic cycle life of 50% discharge for lead. That would give us 600 cycles at that DOD for the AGM compared to 2,500 at the even deeper discharge of 80% for the LiFePO4. Already you can see you may need to replace your lead-acid type battery 2 to 4 times as often as the Lithium. Of course loads, operating conditions and calendar life have to be factored in too. Regardless you get the idea – Lithium does more and lasts longer. Useable energy and cycle life are based on 80% depth of discharge for Li-ion and 50% for AGM, these being considered the most economic use of those battery types. Higher loads with lead will further reduce available Wh (Peukert’s Law) when compared to Li-ion. Make what you will of the above and whilst you are pondering the pros and cons don’t forget to take these additional factors into account for the comparison above. Shipping: If you are replacing your lead from 2 to 4 times as often as Li-on and the fact that the lead weighs around 3 to 4 times as much (depends on Li-ion chemistry used) – then do consider the extra shipping costs. Voltage stability: The voltage profile is far flatter for Li-ion compared to lead. Voltage sag: Subject to the load, voltage sag with lead is significant compared to Li-ion. Li-ion has much faster charge times and if charging from a generator it saves on generator runtime. A lead-acid battery will fail prematurely due to sulfation if it operates in deficit mode for long periods of time (i.e. if the battery is rarely, or never at all, fully charged). It will also fail early if left partially charged or worse, fully discharged. By comparison a Lithium-Ion battery does not need to be fully charged. This is a major advantage of Li-ion compared to lead-acid which needs to be fully charged often to prevent sulfation. Efficiency. In several applications (especially off-grid solar), energy efficiency can be of crucial importance. The round-trip energy efficiency (discharge from 100% to 0% and back to 100% charged) of the average lead-acid battery is 80%. The round-trip energy efficiency of a Li-ion battery is 92%. The charge process of lead-acid batteries becomes particularly inefficient when the 80% state of charge has been reached, resulting in efficiencies of 50% or even less in solar systems where several days of reserve energy are required (battery operating in 70% to 100% charged state). In contrast, a Li-ion battery will still achieve 90% efficiency even under shallow discharge conditions. Don’t forget too that Lithium has little or no Peukert effect when compared to Lead types. This is especially important when considering loads with lead-acid higher than 0.05C (Battery Ah divided by 20 or Ah multiplied by 0.05). In other words for a 100Ah AGM with a Peukert of say 1.15 or more and discharging at 0.25C (25 Amps in this case – which is 5 times the 20 hour rate) there will be significant reduction in capacity – as there will be at colder temperatures too. Li-ion has a Peukert of around 1.05 when compared to lead of around 1.15 to 1.25. The bottom line is you no longer have the Ah you purchased, whereas with Lithium there is little to no effect, helped by a lower Peukert and good voltage stability. That is especially important with constant inverter loads – a place where lithium shines. If you want to learn more about Peukert and run a spreadsheet to see such effects, then I have found this link most helpful. Finally and one I’m always grateful of is vastly reduced charge times, no more waiting for hours of lead absorption charging to get from 80% to 100% SOC. Conversely Li-ion flies up to around 98% SOC in bulk with those last few percent in absorption to fully balance the cells – and unlike lead you don’t always have to fully charge to 100% as often. Note that your 12V charging system needs to accommodate 14.2V – 14.4V ‘absorption’ and ‘13.5V’ float. If charging from an alternator also note the maximum continuous charge currents for the 12.8V range, by checking the datasheet. Not wanting to sound too evangelical, we also need to consider the few downsides of Li-ion. Higher upfront cost and to some extent higher capital risk. Charging is restricted to the +5°C to +45° range, subject to an internal means of blocking the charge source when the temperature is below +5°C. Note this is currently automatically possible with Victron MPPTs when used in conjunction with the Smart Battery Sense for instance. Other products are being worked on to achieve this too and documentation to that effect will be updated in due course. The SuperPack (unlike other Victron Lithiums) is not designed for series connections. The solar-powered station has a total of 225m2 solar panels comprising of 165m2 on the station’s shop and restaurant building, and 60 m2 on the pump island canopy. Mr Eric Fanchini, Managing Director, said the energy architecture comprises of the solar panels, inverters, batteries, genset and the grid. Mr Fanchini stated that it was his outfit’s goal to solarize at least 50 per cent of their network of 250 service stations within five years. He indicated that the solar installation was in accordance with the company’s ambition of being the ‘responsible energy major’ as solar was now part of the modernization plan of Total Petroleum Ghana. Dr Mohammed Amin Adam, Deputy Minister of Energy, commended management of Total for taking advantage of the abundant renewable energy opportunities in the country. Dr Adam announced that the Ministry of Energy had commenced the implementation of the scaling-up Renewable Energy Program (SREP) with the objective of delivering over 55 mini-grids, 38,000 stanalone solar home systems and 15,000 net-metered solar-with-storage systems for homes and small-medium enterprise across the country. Dr Adam added that the Ministry was accelerating the process of promoting the use of solar in public buildings and facilities to reduce their reliance on the national grid as well as improve the financial health of the utility companies. “We are currently procuring 65k Wp solar to meet about 35-40 per cent of the Ministry’s total load and this would be extended to cover the other state institutions”. Mr Kojo Jackson, Director, Human Resource and Administration, National Petroleum Authority (NPA) congratulated Total for being the first petroleum company to commission a solar service station in Ghana and urged them to maintain the high standards in their operations. Mr Jackson expressed concern about the illegal fuel activities undertaken by some unscrupulous persons noting that the NPA was collaborating with the security agencies to deal ruthlessly with any person found culpable in the act. 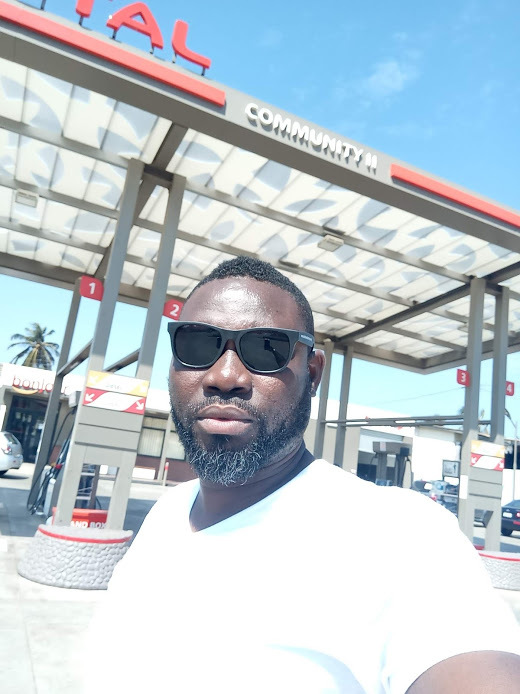 He added that any licensed petroleum service provider found to be engaging in any illegality would have its operating license suspended or permanently revoked. When it comes to the buying decision for solar inverters, some buyers might be inclined to only look at pricing and spec sheets. 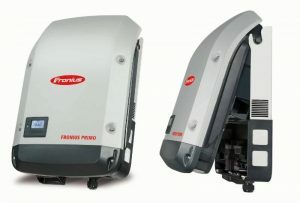 While these are certainly buying criteria that should not be neglected, it is just a small portion of the bigger picture that needs to be looked at when choosing an inverter brand – because an inverter is more than what’s in the box.But why should you even consider Fronius Solar inverter? As the solar inverter industry is becoming more commodified every year, inverter spec sheets are starting to look a lot more similar. Many inverter capabilities are driven by the same market requests and NEC code regulations, making features and pricing very similar across all inverter brands in the market. Therefore, a buyer could think that the only thing to look at is the price tag. However, it’s crucial to actually look past the spec sheet and the initial purchase price. When picking an inverter, you not only chose a piece of equipment, you are choosing a partner to work with for the next 20+ years. Thus, you might want to look into more than just “the box” and its price. So what specific buying criteria is there beyond specs and price? 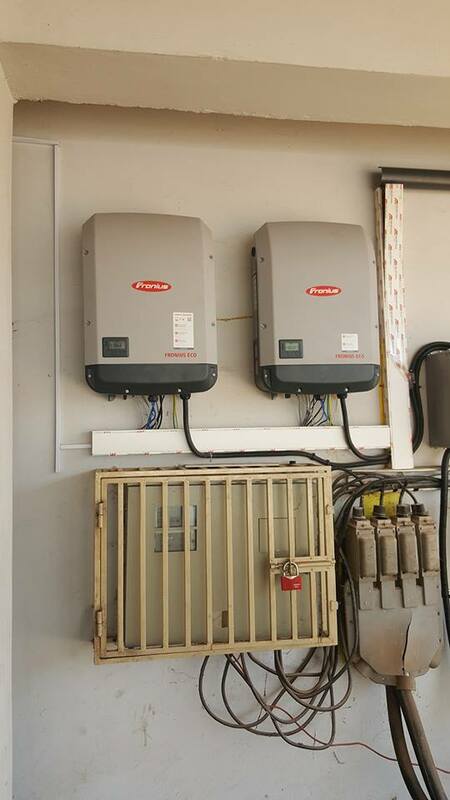 The inverter is a critical component of a solar system, as it is not just responsible for DC to AC conversion, but also for the safety of a system, maximum power point tracking, grid interconnection and system monitoring. 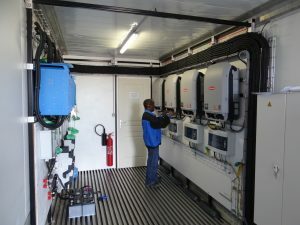 It is obvious that the inverter and its performance have a big impact on a system’s Levelized Cost of Energy (LCOE) and profitability – inverter uptime, operation & maintenance (O&M) programs and warranty matter in that regard, and this is where the company behind the inverter plays a crucial role. 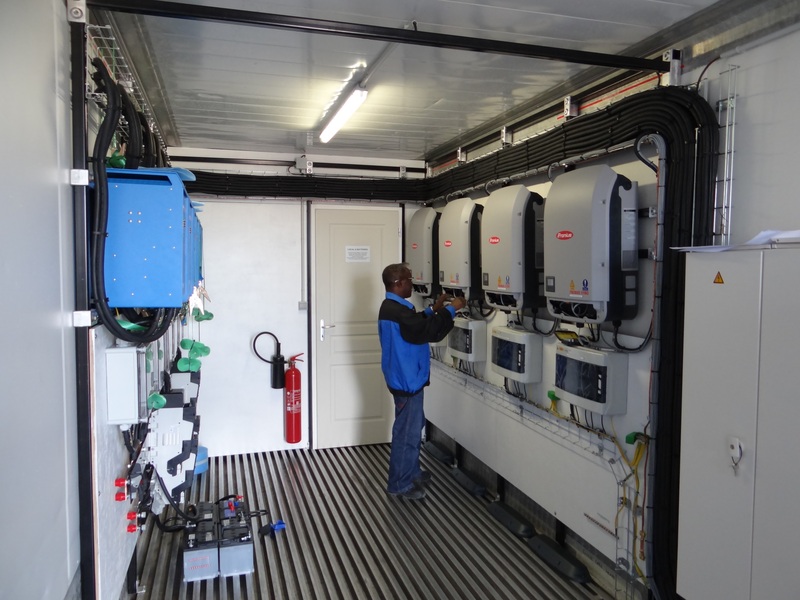 When choosing an inverter partner for the long term, it is crucial that this partner is around beyond the lifetime of a system. Therefore, financial stability and bankability, as well as a global footprint with a local support infrastructure are key aspects to look at. There is no doubt that the fairly fragmented inverter market will see further consolidation, given the ongoing price pressure. This increases the risk of certain manufacturers going out of business and leaving both installers and system owners in the lurch. Furthermore, an easy to reach manufacturer support hotline and personal, long-lasting relationships on manufacturer’s level help installers through the entire process from designing systems to after-sales service for 20+ years – ensuring uptime and quick service. Since all power electronics can fail at some point, customer-friendly warranty terms and an easy RMA process are making a big difference. Power electronics manufacturers from advanced industries even offer spare part kits among certifications for contractors to conduct repairs cost-effectively in the field and within one truck-roll – a big impact on the profitability of a system. All these aspects make a big difference and cannot be found on a spec sheet or on the price tag. Make a smart choice. Do not just look at the spec sheet and the price tag, when picking your solar inverter. 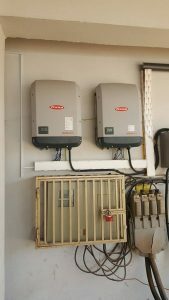 It’s a decision that will impact you over the next 20+ years and you want to be sure that your considerations are aimed at this period of time too.That is why Fronius solar inverters is a great choice. Fronius has been in business for more than 70 years and shows a proven track record of long-lasting customer relationships and ongoing support for every product ever shipped. The company is privately held and cash operated, providing highest bankability. Fronius business is based on three independent business units which focus on completely different industrial sectors (Welding, Solar, Battery Charging) – yet they are based on a common technological focus on energy conversion. The Fronius 24/7 Service Solutions for inverters include online monitoring, Solar Online Support around the clock and the Fronius Solutions Provider program, a network of certified installers with direct access to Fronius. Mr Kwabena Otu Danquah, the Head of Renewable Energy Promotion of the Energy Commission, has advised organisations to shift to the solar net metering system to save them from getting into the higher consumption rate bracket. He said net metering was a mechanism that fed the national grid with surplus solar energy from households while assisting them to save cost and urged consumers to take advantage of it. Mr Danquah was speaking at a two-day solar industry workshop in Accra organised by the Netherlands Development Organisation (SNV) and the Association of Ghana Solar Industries (AGSI) on current initiatives and opportunities in Ghana’s energy sector. He said the Energy Commission, in collaboration with the Electricity Company of Ghana, had installed 35 net metering systems in various homes in Accra on a pilot basis. “We are waiting for the Public Utilities Regulatory Commission (PURC) for the gazette to ensure that the new solar metering system fully takes off in Ghana,” he said. Mr Danquah said the Energy Commission had created the enabling environment to ensure the attainment of enough renewable energy targets by 2020. He said by the provision of the Renewable Energy Act 2011, 832, the Energy Commission, in collaboration with the Ghana Standards Authority, would enforce the law on the importation of renewable energy products that would meet good standards and certification. Mr Emmanuel Aziebor from the Netherland Development Organisation, a resource person, urged stakeholders in the solar industry to come out with substantive business models to convince the microfinance companies to invest in solar energy. He advised the technical experts to support and sustain the technology whilst training more technicians on it. Mr Eric Omane Acheampong, the President of AGSI, advised the members to develop activities on networking to enable them to assess their progress while sharing knowledge. Mr James Robinson, the SNV Leader for Energy Sector, Ghana, gave the assurance that the SNV would continue to facilitate the activities of AGSI to sustain and promote solar energy in the country. Victron Energy CANvu GX …information you can touch!